I made a GIF set documenting Hollywood's blatant mocking of the ridiculous 'moon landings'. [To admin:] If this is the wrong place for it, please delete or move. TRUMP WANTS TO GO TO THE MOOOON ! "President Donald Trump signs an order directing NASA to resume human exploration of the moon and eventually mars." Jobs! Jobs ! Jobs ! That's what the Grand NASA Hoax is all about - isn't it? What a dreadfully silly world we live in. Upper left of right arrow of LM. Looks like an astronot doll. SmokingGunII » September 18th, 2016, 9:07 am wrote: Has anyone asked NASA if they have a photo that shows the horizon on the moon further than 100 yards away? How about this, one of Buzz's favorites a pic that Neil took of Buzz. The shadows in the visor and the shadows of aldrin don’t correlate, to me anyway. Another thing I’ve noticed is that you never see the astronauts face (in the moon pics) in any of the photos that I have seen. Maybe because they were somewhere else tripping on LSD and there were actors in the suits instead and/or the suits were just miniture props. I am thinking that if I was an astronaut on the moon, I would have flipped my tinted visor up for a couple of seconds so my buddy, Neil, could snap a quick pic of me in that moon suit. One of the issues I found confusing with that picture is the other astronot reflected in the visor, because it can't be Neil. Buzz is quoted as saying why he likes the picture taken by Neil. So were there 3 men on the moon ? Plus the curvature within the visor matches up with the curvature outside. "Why am I seeing the moon terrain through the astronaut's body in the Apollo 11 moonwalk video?" "You don't, you see an artifact called image lag, typical of certain television pickup tubes of the era, including the Vidicon tube used in the Apollo TV Camera. This type of camera tube projects a scene onto a photoconductive target, creating a charge-density pattern which is then scanned to create the electric TV signal. The electrical charge remains present on the target until it is re-scanned or the charge dissipates. The image lag causes a characteristic smear or tail following fast-moving objects in a scene, and prolonged exposure of a bright stationary object results in a slow decaying after-image that looks like a ghost or x-ray effect." "You also have to understand that video was basically in its infancy at the time, portable TV cameras were power hungry monsters and special cameras had to be designed for the Apollo missions. 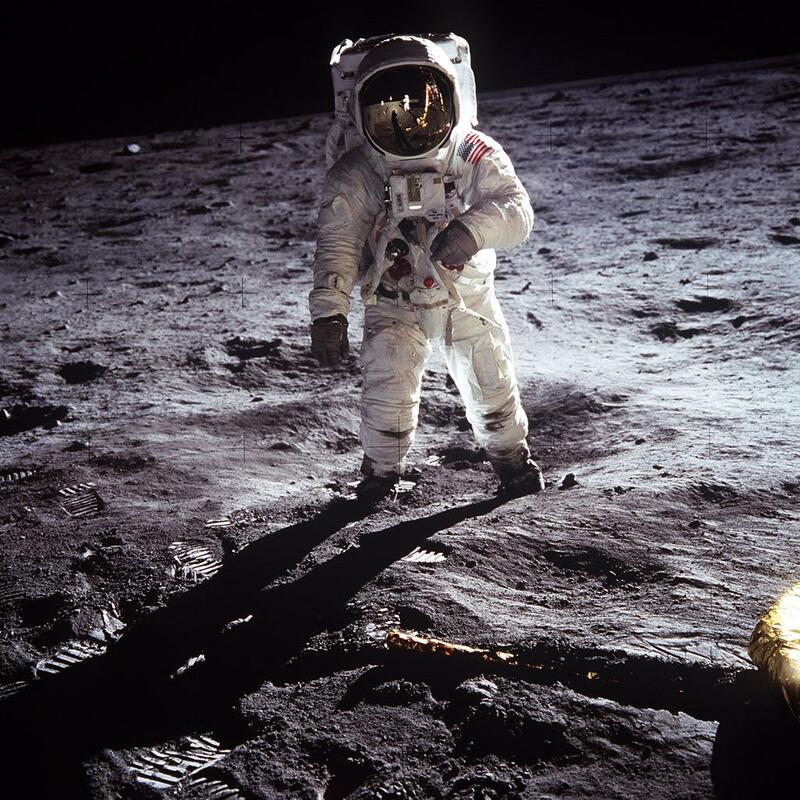 The video system used for Apollo 11 was non standard , which means it was not the same as used by the networks, which in the USA was 525 line 30 frames per second,(FPS ) and in Europe ( mostly ) 625 lines and 25 FPS. The Apollo 11 camera was 320 lines and 10 FPS, which meant you couldn’t get a picture on a standard TV - unless the signal was converted. This system was used to save power and to reduce bandwidth used on the radio signal from the moon. It was , as the other respondents have said, a vidicon type camera , which were susceptible to image stick and lag, plus blooming on highlights. But those who saw the original image at the receiving stations in the USA and Australia stated that he image was a lot better before the conversion. The conversion process was fairly basic with an RCA broadcast camera mounted in a rack pointing at a long persistence monitor, this meant that the image basically “stuck” on the screen for a moment smoothing the motion. The broadcast camera, working at 525 lines and 30FPS , then output the image at US network standards. This conversion process was responsible for a lot of the image “transparency” problems and ghosting. ( I have not included details of the fact that the signal was put through a disc recorder also to store frames to make up the missing frames for the display ). The converted signal was then sent from the Australian receiving stations via microwave links, satellite and land lines to New York from where it was distributed to NASA at Houston and the various networks worldwide. This further degraded the images. Subsequent missions used a different camera that gave a color signal using a revolving color filter wheel, this gave a very much better image than the Apollo 11 TV transmissions." "In the early days of film, the studio could film the actor against an entirely black background. 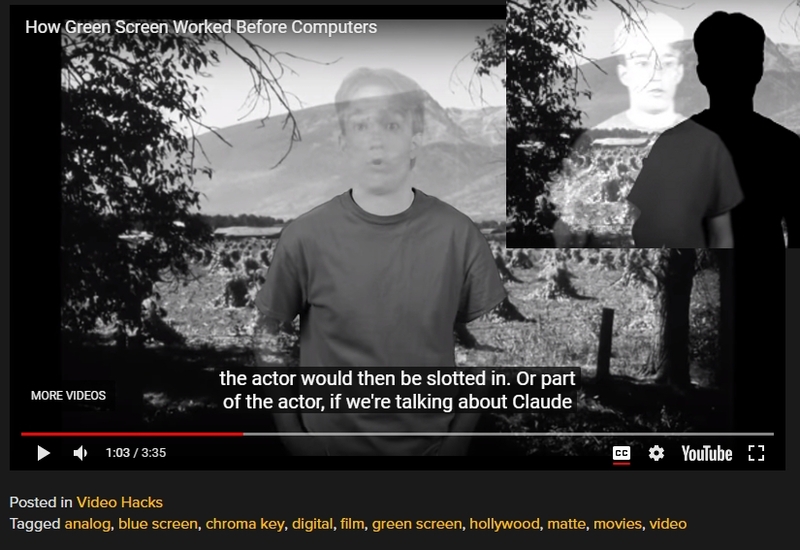 Then, they would copy the film over and over using higher and higher contrasts until they end up with a black background, and a white silhouette of the actor. This film could be used as a matte. 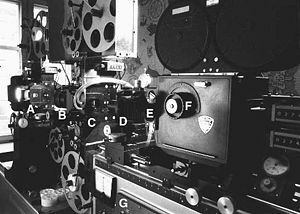 Working with an optical printer, the studio could then perform a double exposure to combine film of a background with the film of the actor. You can imagine that this was a much more cumbersome process than making a few mouse clicks." So what's an "optical printer"? And was such technology (from the 1920's) still used in the late 60's - i.e. during the Apollo years? The answer is: yes. "The first, simple optical printers were constructed early in the 1920s. Linwood G. Dunn expanded the concept in the 1930s, and during World War II he was commissioned by the United States armed forces' photographic units to design an optical printer that could be ordered as a stock item like a camera. Development continued well into the 1980s, when the printers were controlled with minicomputers. Prime examples of optical printing work include the matte work in Star Wars (1977)." Incidentally, I personally doubt that Stanley Kubrick was behind the piss-poor Apollo imagery (as popularly believed). He was a far too talented perfectionist to have possibly crafted and vetted those horrendous "special fx" concoctions. More likely, some incompetent military-trained operatives of the United States armed forces' photographic units (working at the Lookout Mountain studios?) were tasked with the job - and simply weren't up to it. Good heavens... How much longer will this giant farce played upon mankind remain credible (to most [?] earthlings) as a true "giant leap for mankind"? I don't know. That green screen theory makes sense but I always figured they were using front screen projection and just didn't have the light levels right for Apollo 11. Like you said it was produced by mere video technicians who only visited Kubrick's "NASA east" studio in London for a short while in '67 or '68. And they had a lot to learn in that short time. Whatever was going on, that is definitely not phosphorescent ghosting we're seeing. The astronaut would be smeared while he moves after crouching still for a while elsewhere in that video. I felt for some comedy last night when I had trouble sleeping, so I watched this Apollo 16 "documentary". My best laugh was at 10min 50sec when they set up an "ultravilolet camera to provide the first astronomical observations from the Moon". Look at that sky... Is that a tarp hanging on the Sun!? How can anyone believe that the pads with that beautiful gold foil would not have some dust on them ????? heniek1812 » September 25th, 2018, 1:18 pm wrote: How can anyone believe that the pads with that beautiful gold foil would not have some dust on them ????? That photograph has "studio" written all over it. Even if it is claimed they wrapped the gold foil around the footpad after landing, those immaculate surfaces are plain silly. The 10,000-pound thruster allegedly used during landing left no crater in the dust either. And what is the deal with that triangular mark in front of the footpad? That triangular mark on the lunar surface about 4 o’clock on the foot pad looks very feminine to me. A friend of mine who is an avid Star Trek fan and lover of space topics thinks in part that NASA "cleaned" up the image for PR value. I was think, what ??? A historical event occurs and they will clean up the photo. Pure BS. To me that photo says "You are dumb if you believe that this was taken on the Moon." Sort of like that passport in the WT rubble in 2001. By the look of those foot print tread marks (to the upper right) the ground looks quite damp to me. antipodean » September 26th, 2018, 6:38 am wrote: By the look of those foot print tread marks (to the upper right) the ground looks quite damp to me. The fact that some degree of moisture is necessary to hold fine dust together in the shape of a footprint has been much debated in the media, with the usual self-appointed "myth busters" presumptuously putting down their favorite strawman conspiracy theorists. The take-away for the common joe is that the case against the Moon landing fairy tale rests on moist footprints and a flag waving in the lunar wind. But back to the photograph: Why is the ground on the left blurry? Was it necessary to conceal some inconvenient object or print? Or was it heated to thousands of degrees by blazing rockets?